Pressure Cleaning Brisbane the Gold Coast and Sunshine Coast Service. Professional water blasting service with 22 years experience in high pressure cleaning. Hot or cold water pressure washing for concrete cleaning with chewing gum removal, house washing, commercial building washing, warehouse washing, carpark degreasing, construction acid washing or brick cleaning. Professional Water Blasting Service with 22 Years experience in high pressure cleaning and hot water pressure washing. Specialising in concrete cleaning, degreasing and chewing gum removal for commercial buildings, industrial warehouses, shopping centre car parks and loading docks. From shopping centre car parks to cafe courtyards, our pressure cleaning services will refresh the appearance of your commercial property. We understand the broad range of requirements for the industrial sector, including the need to focus on environmental compliance and safe work practices. We can wash your house walls, roof and gutters, paving, pool area’s and driveways. Great for selling your home or just giving your property a facelift! Want to see more before and after examples of pressure cleaning results? View our full gallery. We don’t charge you for travel time! 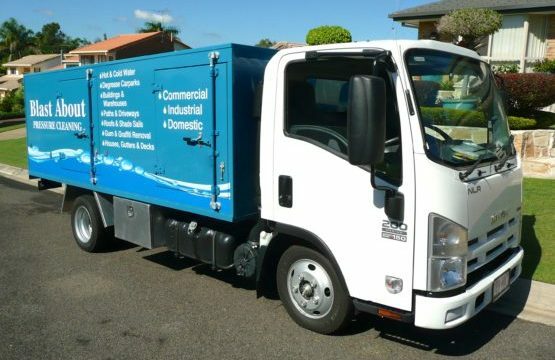 With three locations we service all the suburbs of Brisbane, the Gold Coast and the Sunshine Coast, Queensland. Not sure how much pressure cleaning costs or what’s involved? Contact us for advice and a free pressure cleaning quotation for your property. Blast About has over 18 years experience within the cleaning industry working with shopping centres, property managers, councils and property owners. What could pressure cleaning services do for you? Thankyou to Shane and the team from Blast About for cleaning my house. I would highly reccomend your company to anyone wanting a efficient and professional service.